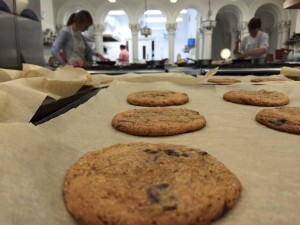 The Edinburgh New Town Cookery School is the leading professional cook school in Scotland. The school trains chefs who go into some of the top kitchens in the UK. I knew, therefore, that I was in good hands when I took a short gluten free baking course last week. The ENTCS is on a lovely street in the New Town and is a fresh and bright building. There was only a handful of cooks the day I went, so I was really fortunate to have almost one to one training in the gorgeous kitchen, complete with ornate pillars! After some coffee and gluten free flapjack to welcome us, we rolled up our sleeves and got on with the baking. 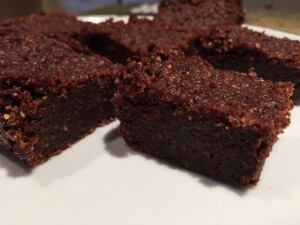 Now, I bake brownie at home all the time, but it was good to try a new, flour free recipe. With lots of almonds, eggs and butter, this brownie is almost fudge-like, solidfying only after leaving the oven. Contamination is obviously important, so we were drilled in good kitchen habits – something I can definitely learn from! This cake is amazing! We blitzed boiled oranges, then added blitzed almonds to an egg and sugar mixture which we whisked over heat. This created a mousse-like base for the cake. Remarkably, for a group with differing levels of cooking skill, the cakes emerged from the ovens looking identical – we decided this was testament to the skill of our teacher, Collette. The orange cake is doused in a delicious orange and lemon syrup and I should say that my post-course testers finished it very quickly! These cookies were really quick and easy to make. Using dark brown sugar and GF flour produced soft and tasty trays + trays of cookies! Having experimented myself to find the perfect cookie recipe, this is definitely one I will use myself. with all the recipes we made, these are freezable, so I am ready for my next takeaway now! This course was extremely good value at only £80 for a long morning. The cooking never stops and the teaching is terrific. Even a hardened baker like me learned things I didn’t know (particularly that when I “fold” I do it all wrong! 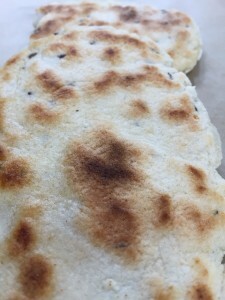 ), plus to get new recipes and try them out with a patient and friendly teacher, makes finding your way through the maze of gluten free cooking, a doddle. One of my fellow trainees was a student who had never baked, but by the end she was confident about cooking in the future and really happy with the piles of food she took home! So much of the mass produced gluten free substitute food is full of high GI rubbish, so learning some quality gluten free baking is a really good skill to acquire if you want to eat well. 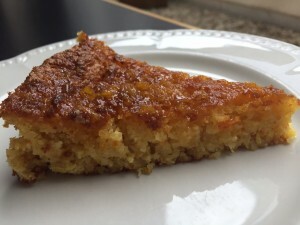 The Edinburgh New Town Cookery School does a couple of these courses each year and it really is a good, fun way to learn how making your own gluten free cakes and bakes will change your life.